St Kitts and Nevis are idyllic and unspoiled sister islands in the Caribbean. Unlike some of the more popular resort islands that cater to those travelers that want to stay at their all inclusive beach resort for their entire vacation, St. Kitts and Nevis are for those honeymooners that want to explore local restaurants for dining as well as explore some of the natural beauty of the islands. Courtesy of St. Kitts Tourism Authority. Unauthorized use not permitted. 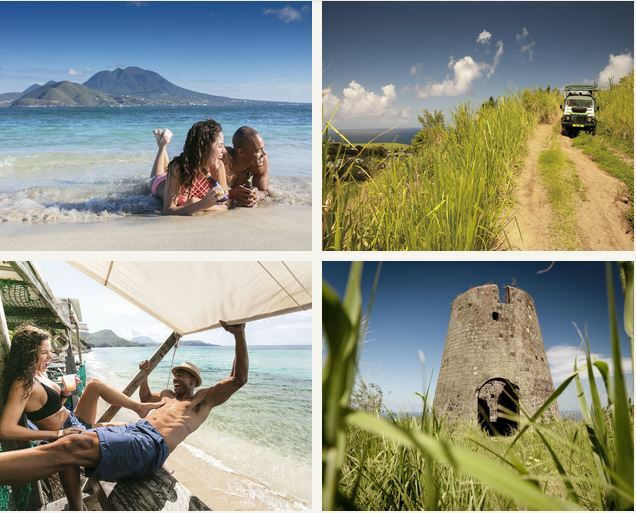 What makes St. Kitts and Nevis such a great honeymoon destination? 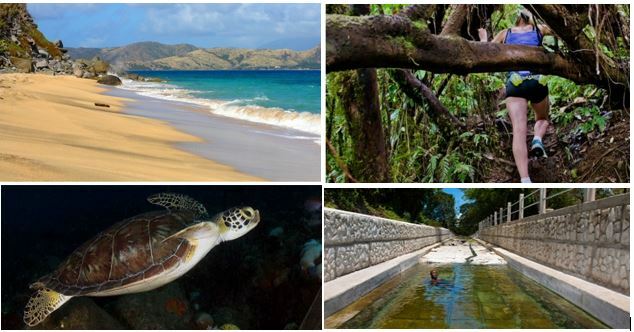 You’ll find these islands to be unspoiled, safe and with friendly locals. There is no reason for you to stay at all all inclusive resort since you can enjoy fresh seafood, bold Caribbean flavors and cool cocktails in a multitude of authentic settings around the sister islands. You can get around easily by renting a car or hopping into a taxi and it’s easy to take a ferry (departing virtually hourly from early morning to later afternoon and early evening on Fridays and Saturdays) between these sister islands to explore them. St. Kitts and Nevis have a very favorable currency exchange rates- 2.7169 Eastern Caribbean dollars to $1. St. Kitts has rolling landscapes, aqua blue seas and white sand beaches. There is a volcano rising above a tropical rainforest with warm and friendly Kittitians (locals) who have gone out of their way to ensure that their island remains virtually unchanged by modern sprawl. No buildings can be taller than the surrounding palm trees. St Kitts is full of history, nature and unspoiled beauty that is waiting to be seen and enjoyed. Sister island, Nevis, is only 36 square miles large. It has just over 400 hotel rooms on the entire island so you may feel as if you are on a tranquil secluded island. It’s tranquil without the hustle and bustle. A traffic jam on Nevis is likely to be when a few sheep or goats wander onto the road. With lush green foliage and jungle trails surrounding Mount Nevis, sparkling clear water and white sand beaches, this charming island is for honeymooners who want a peaceful and a bit more luxurious honeymoon. Winter is peak season in St. Kitts and Nevis. The drier months are December to June, with the least rain coming in February to April. As with most of the Caribbean islands, St. Kitts and Nevis can be hit by a hurricane with the highest chances from August to October. Hotel rates tend to drop in May and June. February is Carnival month so it can get a bit more crowded in St Kitts. Keep in mind St. Kitts and Nevis’ average highs can be around 80 degrees Fahrenheit year-round. What is there to do in St. Kitts and Nevis? What is there not to do may be the better question! What kind of accommodations can you find in St. Kitts and Nevis? On St. Kitts, you can 4 and 5 star resorts like the Marriott and the Park Hyatt, as well as small boutique properties. On Nevis, the only “big” hotel is the Four Seasons but there are some great boutique, family run properties. 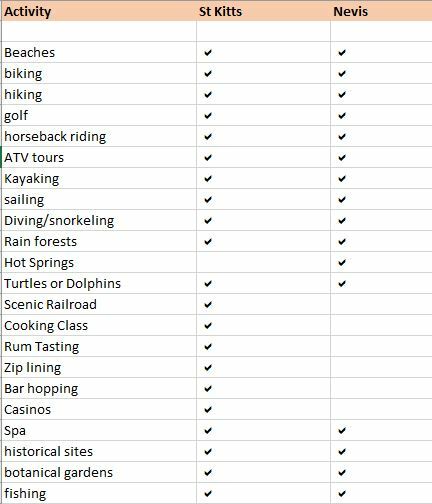 What would a honeymoon to St. Kitts or Nevis cost? This is a very hard question because pricing will be based on the time of year and the type of accommodations. We recently priced out 7 nights at the Marriott St. Kitts, with their inclusive experience dining/beverage plan, with airfare from NYC in early December for less than $4000 for both of them. There was a 2 night free promotion during this low season. The inclusive dining/beverage package is seasonal (lower season) and prices in peak season can be 50% or higher more. For a week, in a 5 star property in peak season can run between $6500-7500 but that same property is less $5500 in lower season. What is the best tip for a honeymoon couple going to St. Kitts and Nevis? Pass up the all inclusive plans and explore the great restaurants on the island. My Vacation Lady is a top rated honeymoon specialist. Our goal is to match the right destination to your dreams and budget. When it comes to your honeymoon, you only get one chance at a great first honeymoon. We can help!